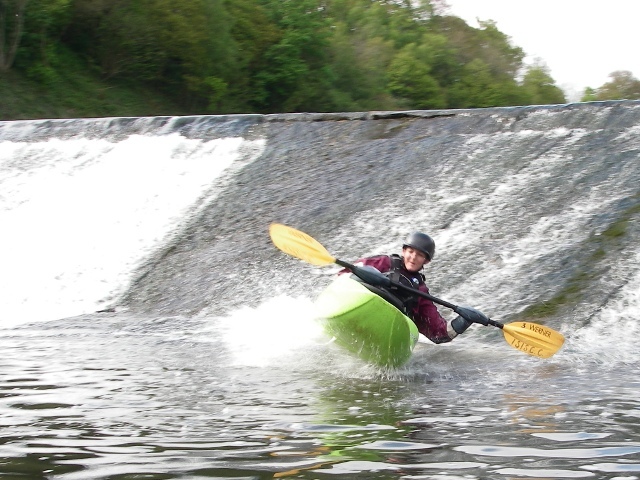 On Sunday 26th April six members of Isis CC descended on the River Taf in Wales for the 3* White Water Kayak assessment. Mike Brockley, Ruari Fangman and I were joined by our assessors Helen and Glynn Carter, and an impartial observer, Simon Terry. 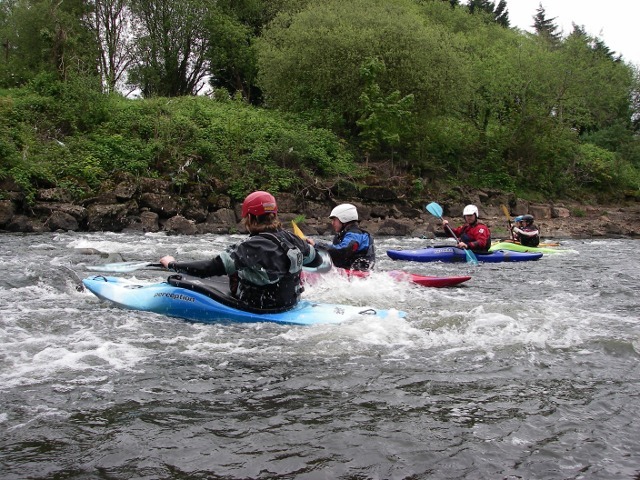 The first day of assessment, on the Saturday, included kayaking theory and flat water skills covering topics such as access, first aid, equipment, etiquette, navigation and planning. The group was joined on Saturday by Russell Clarke and set off for a paddle. We had all forgotten about the University Rowing Clubs taking part in 'The Bumps', where they have to bump the boat in front out of the race, so we had to paddle unusually on the left of the river to avoid being hit by any of the boats racing past. It was clearly a day for fun as we passed rowing boats and punts full of people dressed as French men, bunnies, frogs, and even Robin Hood! We deftly manoeuvred through the various boats and passed under Magdalen Bridge. It is quite hard to demonstrate moving water skills when the weather has been so good and the rivers are not moving. We made our way to Parson's Pleasure weir in University Parks which seemed to be the only place we could find which had a little flow! On the way we were asked to demonstrate efficient forward paddling, acceleration, moving sideways, draw strokes and group awareness. We had lunch at the edge of Magdalen Stream, sat on the grass in the sunshine, and then pushed on to the weir. While at the weir, with an audience looking on in the background (and an angler) support strokes, rolling, ferry gliding and eddying in and out were all used. On the Sunday we all had an early start and arrived in Treforest near Cardiff at 9am. After an equipment check, communication clarification (including hand signals), warm up and stretch we got on the water and made our way downstream. The Taf could be a marvellous river were it not for the amount of litter strewn along and in it. The river level can rise rapidly and the height it reaches was signified by the level the litter reached up the bank. The river bed also had a treasure trove of delights on it, including electrical items, shopping trolleys, and even (to our amusement) an unbroken dinner service including pictures of dogs on it! We gently paddled down through the flatter sections and then when we reached faster moving water we practised eddying in and out, ferry gliding, hanging draws, upstream acceleration, draw strokes and backward paddling. No matter which manoeuvres we completed, Glynn always asked for us to try them with our eyes closed, heightening our other senses as we felt what the water was doing to our boats. Our assessors had carefully planned an 'incident' on the river where we could demonstrate our rescue skills in a realistic environment. At one of our rest stops we heard a shout and found Helen floating down the river through a rocky section (we had all assumed she was off to find a toilet spot). Ruari was first to spot her and alerted the rest of the group by shouting 'swimmer'. We checked there was a safe place to enact a rescue, ensured the rest of the group was safely out of the way and set about our rescue. Ruari and I jumped out of our boats with our throw lines at hand directing Mike to stay in his boat in case we both missed and Helen would have needed a tow to land further down the river in a more placid section. Ruari threw his line first which was a perfect hit, but in the spirit of presenting a realistic situation, Helen lost the line so we needed a back-up plan. I was ready to throw mine which hit the target and we carefully guided Helen to land - our first rescue success! We continued on carefully checking our position against the map and finally came to the end of our trip at Radyr weir. We could see a change in the horizon line and hear the water falling away below. Cautiously we moved forward, then back-paddled a little in case we were sucked over the edge. Our worries were unnecessary though as the low water level meant we actually came to a complete stop against the edge of the weir and we could clearly see a gentle slope down to the water below. One by one we heaved ourselves over the edge of the weir, gliding down the slope and shooting across the run off at the bottom - brilliant! An exhausting but fantastic weekend and I'm proud to say that we all passed!